Martha Small vividly remembers the postcards she received as a young girl at summer camp over the years. They came from her grandmother, collected during her many travels. Rich with images of world landmarks and exotic locales, those cards brought even more to Martha than the warm and loving affection of their sender. They opened a window to the world for this Austin native, generating a curiosity about different lands, people and cultures that remains very strong to this day. But those postcards also passed on several very important messages: Don’t let life pass you by. Reach for your dreams. If an opportunity comes your way, go for it! Now over 90 years old, Martha’s grandmother continues to travel the world and share her adventures with her granddaughter. And Martha has followed in her footsteps. She’s been around the globe and back again; she even spent her honeymoon on a photo safari in South Africa, coming within inches of lions, giraffes and elephants. But it isn’t just her grandmother’s love for travel that has been a lasting influence in Martha’s life. Much more important is the courage Martha has gained to pursue her dreams—and to never let anything hold her back in doing so. That philosophy fuels this talented professional’s life and work every single day. “I’ve seen the world, but I chose to settle down here in Austin,” Martha says. 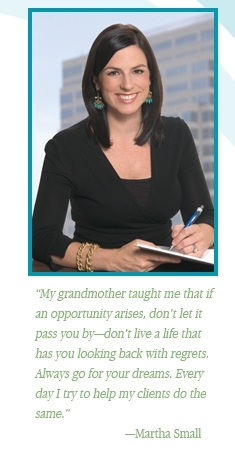 “ And I’ve never regretted that decision.” Indeed, as one of the leading real estate professionals serving the Central Austin area, Martha has devoted her career to helping others pursue their dreams here. No one has a better understanding of what draws people to the area, from the friendly residents and excellent public schools to the variety of recreational and other amenities. As a Central Austin native, Martha has seen it grow and change over the years, and she’s intimately acquainted with its many wonderful neighborhoods. There’s a good reason why Martha’s slogan is Let’s Go! Just as she’s gone for her dreams, she wants to help you to go for yours in real estate. Martha works very closely with you throughout the process, ensuring that you have the tools and resources to make informed decisions. Martha offers a comprehensive network of services and support to help buyers and sellers alike, from a wealth of contractors for sellers and exceptional information on financing for buyers. But it’s the way in which she connects with you that truly makes a difference. Martha stays in close contact with you through frequent updates to keep you informed of the status of your transaction, helping you to anticipate and prepare for each step. “This is such a wonderful place to live,” says Martha. “I love helping people find the best opportunities here.” If you’re considering the sale or purchase of a home in Pemberton Heights, Old Enfield, Tarrytown or other parts of Central Austin, contact Martha Small. She’s here to help you get the very best results, so Let’s Go! Call her today for a complimentary consultation.